Competition is stiff in the 3000-4000 cluster range at the moment. As discussed with Deano today: I hope to be cycling into my 80s... this is a loooong game. 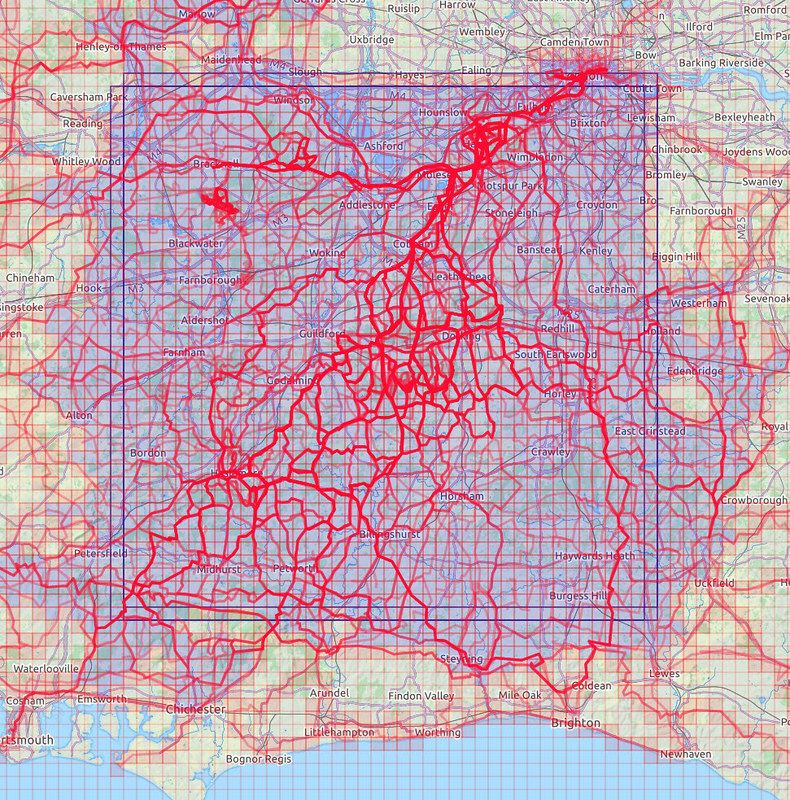 4000 tiles is ~6760km2. The area of the Netherlands is 41,543 km2. I recently found a backup of my bikejournal records. Nothing is popular for long. Mine doesn't limit itself tot he Netherlands. But if you want to check how big a really huge cluster is within the Netherlands, just check the top ranking Dutch rider on the Veloviewer stats. A day in the Wolds with Graeme, and my cluster is up to 3112. Square still on 37x37 (those Pennines squares I need are hard yakka). Am I the only not able to see Deanos photos atm? I could at home, but not here at work. On a cluster of 499 now. Still 16x16. Looking forward to getting back on this on Monday. Today I did a blustery solo 100k to the northeast. The idea was to enjoy the tailwind as I ran away from the rain then turn for home in the lull before the wind really picked up. It mostly worked. The route seemed to flow pretty well although there were a few short spurs to grab tiles. There was one tile to the NW of Kneeton that I couldn't resist. This involved descending on a steep, slippery track towards the Trent. I had to push back up it as there wasn't enough traction to ride it. I then carried a significant amount of mud round the rest of the ride in my shoes and overshoes. The other option to get it was on road - but the other side of the river. I ended up grabbing another 16 tiles and bumping my max square up to 36. At last! Finally bagged my first new squares of the year yesterday. 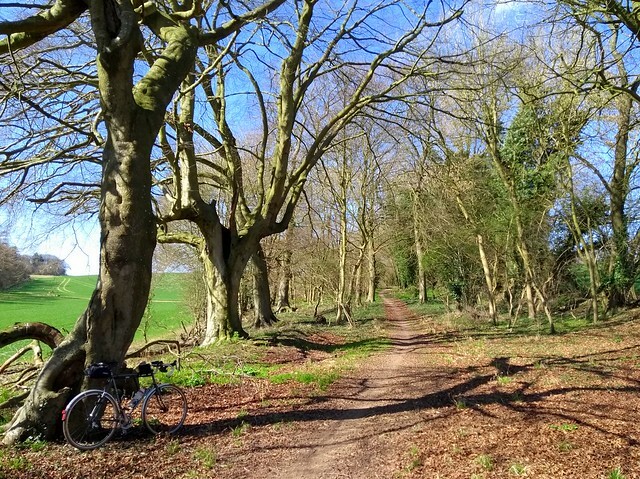 I waited until lunchtime for the snow to melt before setting off and did a 85km loop around North Nottinghamshire, bagging 20 new squares in the process and upped my cluster to 1883. No change to the max square but puts me in good stead for an increase in the future. 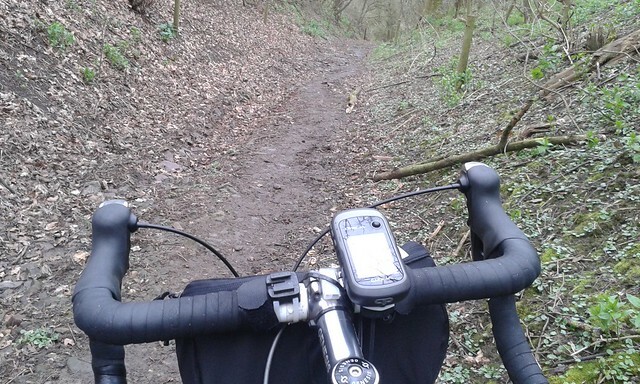 I did a fair bit offroad to get some of the squares and discovered some great new trails - and got very muddy. Starting to get out on the bike here in Vancouver. Got my max square up to 2x2! Looking at the maps here, it's going to be more about clusters and new tiles than a max square. Riding a 200 on Saturday which should help things along nicely. For those not in the know, there really is a cyclists' cafe called Pedalling Squares, which is like a little bit of Hoxton transported to Blaydon-on-Tyne. I wasn't going to stop, but the weather had been so miserable that I needed to get in out of it. And Phil Addyman came over for a chat. I filled a lot of gaps, rode through a very private estate where I would had a very hard time arguing that I'd missed the signs, and accidentally did a turn up the A1, but I linked an existing cluster near Morpeth with my main cluster, and it's now up to 3234. I've been playing this game for a while. Max square is at 41x41. I live near the North East corner of square. There are tiles to get just 7km North of my house, but I'm not really interested in riding there. My goal is to make it to the coast to the South. That should require about 50x50. It's getting quite challenging now, as raids to the Southern border require +160km round trips. I've found it great fun. I've been to some to some interesting places. I've also been to a few that I never want to go again. Welcome to a future of obscure bike rides and Strava tracks that make you look either forgetful, lost, bad at map reading, or all of the above. 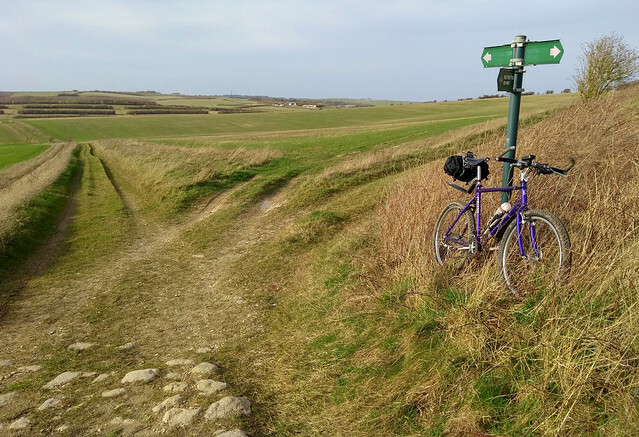 Welcome to a world of looking at your bike, then looking at the edge of the field ahead, then looking back at your bike and deciding to ride anyway. Welcome to 100km rides to get one pesky tile. Happy exploring. When do you think you'll be able to join your new cluster to your Sunderland bunch? You are probably looking forward to the celebration of moving your Max Cluster from the UK to Canadiaboroughbridgetonville. Took advantage of the Equinox spring tides to bag a tile near Hound Point in Dalmeny Estate. Left the bike and had about a 500m walk out through sinky sand and pools of shallow water, but got there in the end. Sand and salt water got through the overshoes and shoes to my socks which I spent 5 mins wringing sand out of in the shower once I got to work. There is one more I may be able to target just West of Cramond Island, but that may need to wait for a fortnight. I love the idea of waiting for spring tides to bag squares. As Graeme says, it's a long game. I finally sucked up the ride straight into the wind to the Dales today to get a few squares I needed around the dead-end valley of Walden. The wind wasn't actually that bad, compared to last weekend, but maybe I'm just used to it. Going around the head of the valley along one of the shootin' tracks with a 45º lean away from the steep drop was interesting. I had planned to carry on over the tops to Coverdale, but the weather was coming in, so sod that. As I was looking at the map on my phone to work out whether I needed to bear right, straight on or straight down, the farmer came along on his quad - shotgun mounted at the front and labrador mounted at the rear. He asked if I was lost, and I explained that I was looking for a way back down into the valley, and just before I could explain that I was looking for the (h'official) bridleway from Fleensop back into Walden, he invited me to use his track back through his farm to the tarmac. Which I did, and it was lovely. It pushed my square up to 38x38 (2 overlapping). 39x39 is relatively straightforward, I think, but 40x40 and beyond will be hard. Two ride weekend. 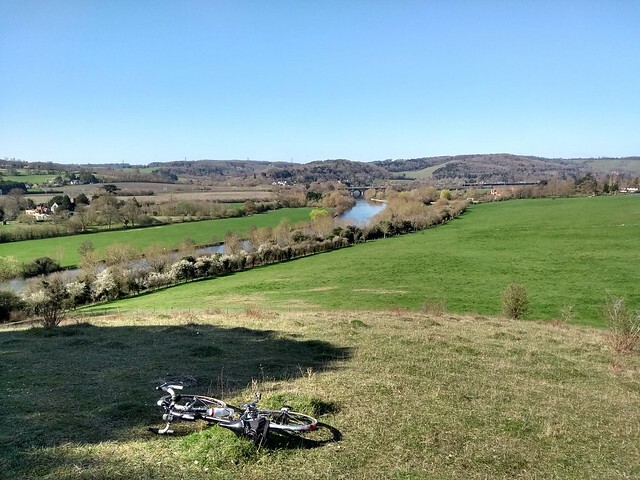 Bagged the 'Column of Victory' tile, accessing public bridleway on the Blenheim estate, in a ride around via Woodstock... Today filled in Goring Gap area & some Berkshire downs. Superb weather. Cluster 599, & 19x19. Short walk involved to access viewpoint, and down to Thames path bridleway section.